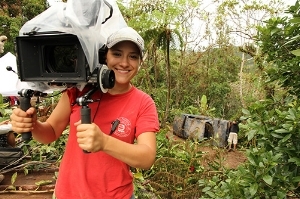 Marielle has been working as a director and producer in Los Angeles since 2008. She’s thrilled to be gaining a reputation as a female action aficionado who delivers gritty, emotionally driven narratives. An east coast native, Marielle received her BA from Harvard and has since travelled across the globe making badass film and television. Her previous work has been successful both online and in the festival circuit, receiving accolades and attention from studios such as NBC, HBO, and Sony. Robert Lam began his career by graduating with acclaim from USC in 2005 after having his thesis cinematography submission: a music video titled I Don’t Know admitted into the South by Southwest Film Festival. He continued to hone his craft photographing music videos for Interscope and Warner Music Group, and received a "Best Cinematography" award for his second feature film A Leading Man at the Los Angeles Asian Pacific Film Festival. Rachel Block's interest in Art and Design began at a young age and grew throughout her attendance at an arts magnet school in South Florida, Dreyfoos School of the Arts. She then attended USC, majoring in Fine Arts, and minoring in Cinema. Since graduating, she has worked on many tv shows, music videos, and commercials in the art department. Most recently she was Assistant Art Director on Spider-Man: Homecoming, Ant-Man, and The Divergent Series: Insurgent and Allegiant. She was the Production Designer on the feature film Jamesy Boy in Baltimore, and worked alongside DP Robert Lam. They are continuing their collaboration on the short film Do No Harm and this is her first experience working with director Marielle Woods. Taylor has been involved in creative arts nearly his entire life - through painting, photography, mixed media and beyond. After transitioning from photography to film early in high school, film became the best way for him to express his ideas, abstract and otherwise. He have worn many creative hats over the last 10 years, including: Running the video team at an online news outlet, directing live news for the San Diego Union Tribune, and helping on many independent film sets between San Diego and LA.